Experience what old Florida was like. 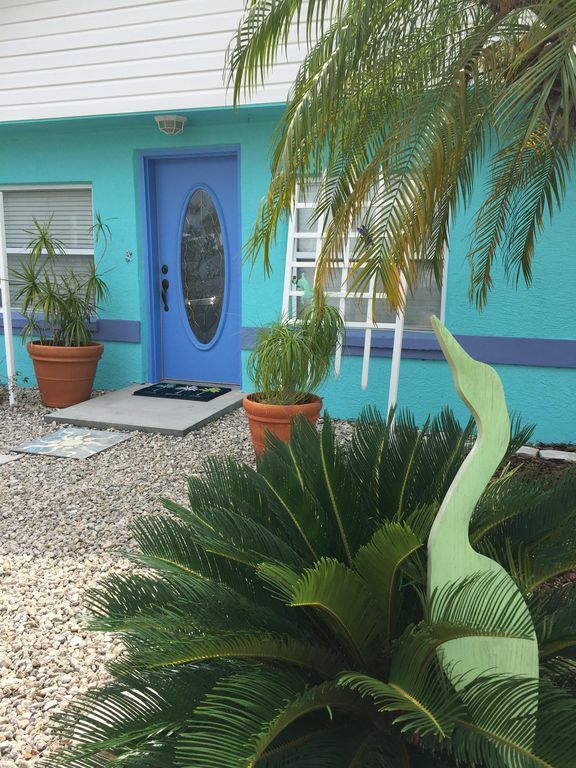 This adorable bright turquoise concrete block beach cottage is right on intersecting canals, five minutes (idling) to Pine Island sound. The view from the huge back porch is straight down a beautiful canal lined with sailboats, coconut palms and breathtaking sunsets. Bike path runs the entire length of the island and we have bikes ready for you. Dolphins and manatees swim right under the dock. Fishing is excellent, even right from the dock. We have some fishing poles if you want to try it. Take the kayaks out for a relaxing trip. The floors are tiled and the tiled, screened-in back porch has comfortable furniture and a ceiling fan. You can sit and sip Margaritas while you listen to the sounds of dolphin and manatees gliding past. Pine Island is known for its music. Numerous local bands play everything from rock n roll to island rock to country. You can walk to the Waterfront restaurant in about 2 minutes and enjoy great seafood and lots of local atmosphere. Many kayak routes are close by and the area is very popular with kayakers and nature lovers. We bought this house in 2001. It was built in 1958 and we basically gutted it and started from scratch. When we reached the bottom layer of paint it was turquoise so we decided to paint the 'new' house the same color. Everything was updated to current building codes. We added a dock and boat lift and had the seawall redone (2008). New wood floors in bedrooms in 2013. Kathy is a Florida native and Thom has been here most of his life. We love the water and really never dreamed that we would be able to have a house on the water. We get there every chance we can and plan to retire there in a few years so you should enjoy our rental while you can! Even though it is close to the city of Cape Coral you feel that you are way out on an island. Our house is at the very tip of St. James City (southernmost). At night you hear the sounds of the water and really feel like you are on a deserted island. The fishing is fantastic. If you go out in the morning it is so easy to just come back in for lunch and a nap and go right back out on the boat. Our friends love to come with us for weekends of fishing, music, good times. From wide sea wall you can see Pine Island Sound. We are located on intersecting canals, providing a beautiful view in three directions. Fish right from the back sea wall. Full sized, stackable with washer, on screened porch. Front yard will accomodate up to four vehicles. With icemaker and filtered ice and water. Full sized glass top stove and oven. Paper towels and napkins, some spices, salt & pepper, whatever someone leaves in the fridge. All tile countertops. Fully stocked with dishes, tableware, pots and pans, serving items. Dining area is incorporated in the kitchen/living area at a large counter with four chairs. Paperbacks are there to share or exchange with your own. Tiny grass lawn in back between house and sea wall. 2, 9' California Xplorer kayaks with seats, paddles, life jackets. Men and Women's bikes there 1 of each. Screened porch on the water. The patio is covered, screened and tiled. There is comfortable furniture and a table. Dock is 25' long. Kayaks, Fishing poles, fish cleaning station. Front area is crushed shell and there is a large step out to the back porch. Doorways are not wide enough for wheelchairs. Dock tie-up available for up to about a 30 foot boat. House renovated in 2005. New flooring in 2013. Sheds have some amenities. Keys on key ring by front door. My wife and I fell in love with Thom and Kathy’s “Old Florida” cottage as soon as we opened the front door and before we stepped inside. The view through the house to the canal the cottage is on and the canal opposite them is spectacular! We asked ourselves, “What can be better than this? !” We got our answer when the sun went down! The sunsets are also spectacular – orange and red hews one day and purple the next. The lanai was our favorite place during the evening. After watching the sun go down we often ate our dinner there and didn’t go inside until after 10 pm. An unexpected bonus was discovering the photo album that chronicles the transformation of the cottage by Thom and Kathy from before they purchased it to today. More people should do that. All the accommodations and amenities were exactly as advertised – including manatee sightings! The cottage is definitely on the list of places we recommend and plan to revisit. The place was lovely and the location is perfect. A herd of manatees spent the day twirling and spraying in the canal. It was easy to relax and the Kuhns were friendly and easy to deal with. Thank you for your kind words and we hope that you will come back again. My husband and I stayed at the cottage for our 12 year anniversary. It was our best trip yet. Thomas and Kathy have thought of everything you might need for a great stay. They even had coffee and sugar waiting! The cottage was tastefully decorated. I already miss that huge shower. The bed was super comfy, but we spent most of our time sitting in the screened in porch looking over the water. I highly recommend The Waterfront restaurant about 200 feet, yes feet, from the house. Great seafood. Other great restaurants are only a short bike ride away. At night it was so quiet all you heard was the water. Thomas and Kathy thanks for making our trip so memorable! Thank you so much. We love to hear about our guests’ experiences in our little piece of Paradise. Thank you so much for your kind review. This is our only rental property and we think of it as a second home. You are welcome back any time and are glad that you enjoyed it. Very nice place! Great location for boating! The Kuhn's were very accommodating and provided any and all information we requested. Very quite location so it was a nice relaxing peaceful stay for my wife and I. I would definitely stay here again and hopefully soon. Little Piece of Heaven in Florida! My family and I had the pleasure of staying here during the 4th of July holiday. Getting away from the craziness Miami has to offer on these dates we were in need of a more quiet and relaxing atmosphere. What a find! This place was perfect. Away from the touristy Sanibel area but close enough to get to on our boat. The house was up to date, neat and offered everything my family needed to enjoy some much needed down time. We had our boat with us and use the boat ramp at Monroe Canal as Kathy suggested and it was a breeze. We had direct access to the waterway and spent most of our days either cruising the sound fishing or anchored at the Lighthouse Beach in Sanibel. Thank you again Tom & Kathy for opening your home. This was exactly what we needed. We had such an amazing time. We look forward to coming back very very soon! Aw you guys! Thanks so much. We try to think of everything to make it comfortable and special. Please come again! Repeat renters - One week or more - 5% discount! Welcome back! Cancellation policy - We require payment in full 30 days before arrival. No refunds except in case of mandatory evacuation of home due to hurricane. A $50 non-refundable cancellation fee will be charged for all cancellations.